There comes a time in nearly everyone's life when you find yourself a little...stuck. Weighed down, overwhelmed, stopped, whatever words you use to describe that yucky feeling. The question most of us want answered is, what can we do to turn things around? So what does it mean to actually BE stuck? The answer can be tricky because we each have our own particular “flavor” of stuck. Ayurveda relates the experience of being stuck to an imbalance of kapha dosha, which can manifest itself in different ways (weight gain, depression, congestion, lethargy, complacency, greed, attachment, diabetes, colds and flu, not expressing emotions allergies, just to name a few). Kapha is the cold, moist, heavy and sluggish energy that is governed by the earth and water elements. In the body and mind, kapha's function is to build things like tissues and attachments, to lubricate things like the muscles and joints and to store things like fat, memories and emotions. It's known as the energy of cohesion, and too much of it can leave you feeling pretty stuck! Kapha imbalances can show up any time, but tend to be more prevalent during kapha time of year (which is spring time for all you springtimers out there!). And if you do happen to get stuck, taking to your yoga mat might be one of the best ways to weather the storm. Getting unstuck is a process of energizing, stimulating, and heating things up in all areas of life. Your diet, your thinking, and of course your yoga. For me it's about creating a sensation of lightness in my mind and body, shaking things up, and breaking out of old ways of doing things. So with that in mind I've changed up some well known (and loved) yoga poses to kick up their kapha busting power and give you the opportunity to experience them in a new and more energizing way! Get ready to build some heat! This variation of an old favorite will have your mind and body running on all cylinders! Practice tips: Tuck the toes under. Interlace the fingers behind you and broaden across the collar bones. Gazing up slightly adds an extra sensation of lightness to the pose (it really does!). 10 deep Ujaiyi breaths and you'll feel ready for lift off! Modification: If the toes tucked under gets too intense bring the tops of the feet to the floor and sit on the heels (traditional vajrasana). 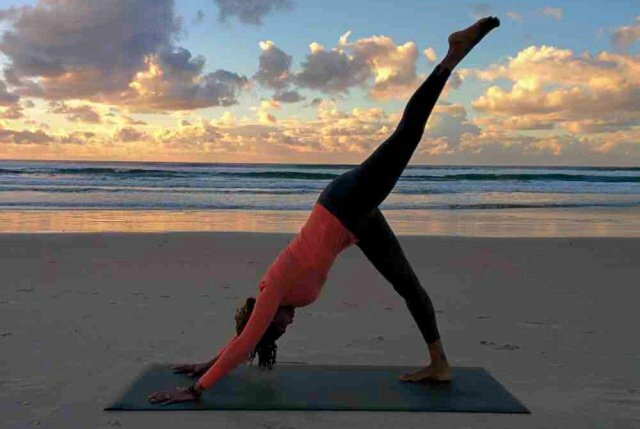 This pose is all about creating lightness and the sensation of expanding out in every direction. 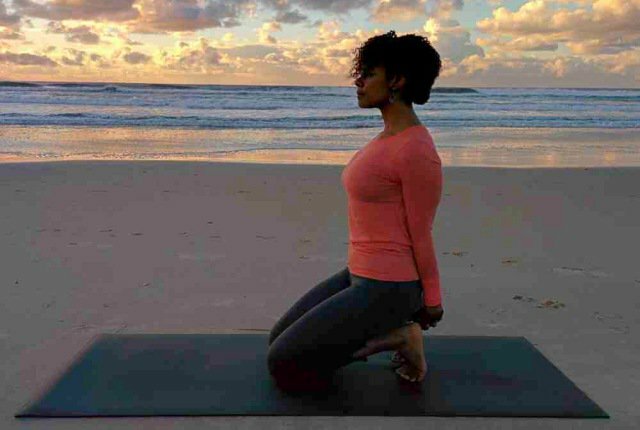 Practice tips: Center the pose from your navel center. Imagine everything you need to fuel this pose flowing outward and upward from there. Spread the fingers wide and feel free to open the hip of the lifted leg slightly. Turn on the heat by engaging the muscles of both legs. 5-8 breaths each side should do the trick! Take it up a notch tip: Engage Mula bandha for the full 5-8 breaths on each side. Movement is a surefire way to stoke the body's fire. This mini sequence combines one of my favorite energizing poses with some arm action to pump up the heat! Practice tips: Reach forward with both hands (jazz hands!) then bring elbows down to your sides and extend arms and hands behind you. Draw the shoulders into their sockets to broaden across the collarbones. Press out through the back heel to fire up the back leg. Try 5-8 full breaths (inhale/exhale) one each side. Modification: Drop down to the knee (back leg) for a low lunge, but keep the arm action going! Balance poses are all about tapas (heat of discipline), and that's mainly because they take focus and strength. Practice tips: Kick up the heat in this little mini sequence by softening into your strength (don't tense up). Gently draw the shoulder blades together to open up that heart. Engage the muscles of the standing leg (keep a micro bend in the standing knee). Most of all, keep everything turned “ON” (muscles and bandhas engaged) in the pose. Dare yourself to take flight! 5-10 full breaths (inhale/exhale) on each side. Modification: Bring your fingers/hands down to the floor or a block, and just move the leg forward and back. Don't forget to engage that belly though! Just about any version of Navasana will serve the purpose of waking up th mind and body. This variation throws in some heart opening by extending the arms out wide. This also turns up the “HELLO” factor in the belly! Practice tips: Engage abdominals (all of them), position legs with bent knees, or keep them straight if you're feeling it. Open arms wide, rolling the shoulders back, and open the palms to the sky. Take 5-10 full Ujjayi breaths. Turn it up a notch tip: Squeeze the knees together or for even more intensity squeeze a block between the knees. Rotate the pinky fingers up toward the ceiling to expand the sensation into the upper back. Modification: Drop one or both feet to the floor. Stay on the toes if you can, rather than bringing the full sole down. Getting unstuck isn't easy. But I'll let you in on a little secret: self expression is actually a great way to balance kapha. Yes, being YOU on and off your mat is one of the keys to getting (and staying) unstuck. Remember this as you live and practice yoga, and make a conscious choice to sing, dance, do that little thing you do, express who you are and what you feel, and don’t hold back! What do YOU do, on your mat or off, to get unstuck?